Letters Patents dated 1577 granted to Robert Hillson of London merchant of Clair. Cooke and continued to the descendants of Gorsuch to bear as their paternal coate. 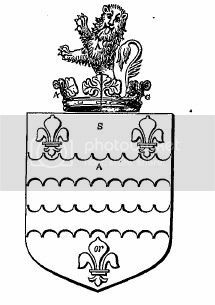 Sable; two bars, argent, engrailed between three Fleur-de-lis, or; crest, issuant from a ducal coronet, gules and argent, a lion rampant, or. My first area of concern is the coronet. The blazon has the colours one way and the image the other. Any thoughts? I have just noticed that the lion's colours differ as well. This is a chicken and egg; which came first, the blazon or the trick? If the trick is right, the blazon is wrong but if the blazon is correct, the trick is wrong - you make a choice. If it was me (in Cheshire Heraldry) I would take the trick and then explain why it differs from the blazon. 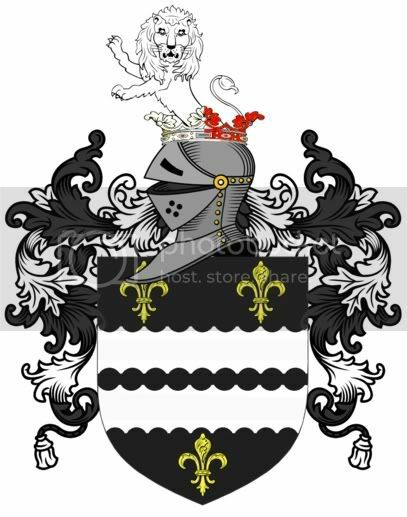 I have based this on the fact that the herald most likely drew the arms as he was presented with them and if that is so, it may be that the blazon has been corrupted as it has been transcribed into the Harleian MS - of course it could be the other way around!! Seriously though; If Stephen is taking the blazon from the L.P. then there would be absolutely no doubt at all that said blazon would be the accurate description of the arms .... however if the information is coming from the Visitations, even if it is quoting from letters patent, then there is a large element of doubt and all Stephen can do is to take a view as to which version he accepts and then makes it clear that there is a doubt and describes the circumstances of each version i.e. he gives the evidence he has presented to us. In that way, it remains with the College of Arms, if called upon to do so, to make a ruling as to which is correct. The blazon has come from an unknown source via a Mrs Gorsuch. I'll have to ask where she got it from. At best, different families with same surname but no other connection. Actually, as I learned very recently from the American Heraldry Society's Facebook page (never visited it until very recently) as well as from a link to a listing early American arms at the AHS's own site, our new Supreme Court Justice is a direct descendant in the Gorsuch line that bears these arms. BTW - How's your German? I see that you responded to my post about searching in Siebmacher. I have another that I will include under that post when I have a minute. I'll have to visit the AHS site more often!